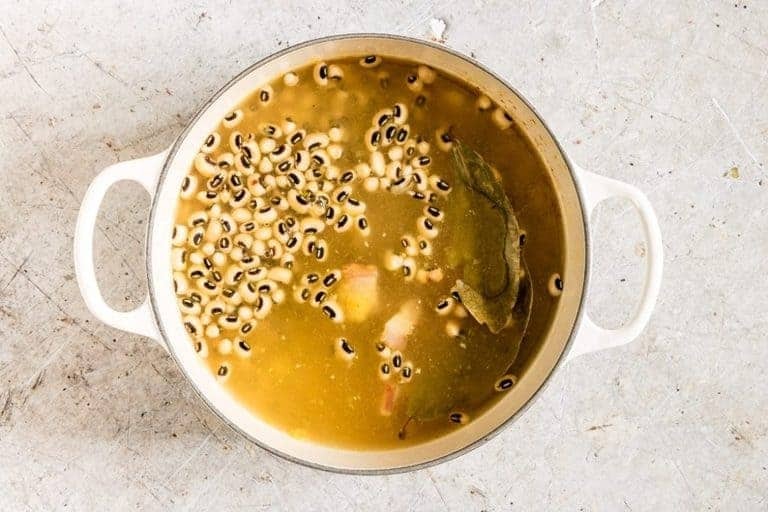 Create the famous Hoppin John soup (or stew, if you prefer) with a little Sierra Leonean twist with this recipe. Enjoy it on New Year’s day for good luck or any day of the year. Do you know what happens when you eat black-eyed beans (a main ingredient in Hoppi’ John soup) on New Year’s day? 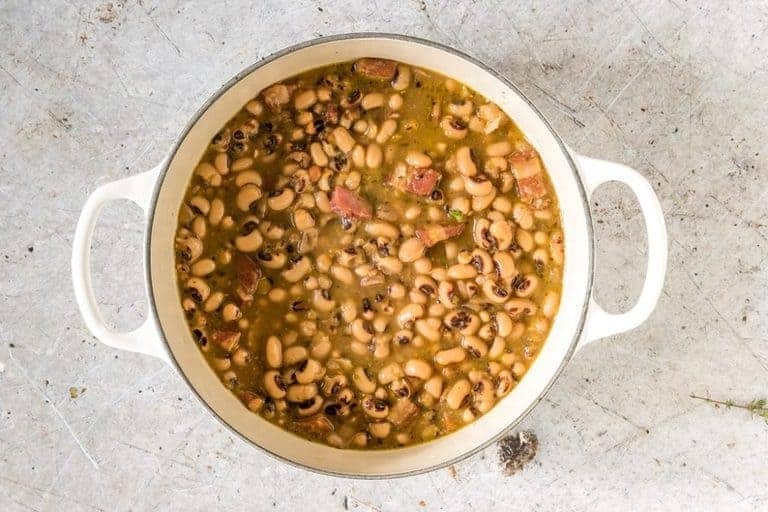 As the story goes, black-eyed beans (black-eyed peas) are meant to bring you luck if you eat them on New Year’s day so I try to serve them at every New Year’s that I can. Every little bit helps right? Sometimes I serve them in a black-eyed bean and sweet potato stew. Sometimes in bean cakes or in some salsa. 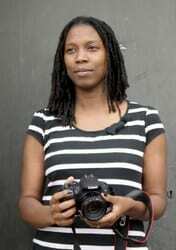 But this year I have decided to dish them up in that famous southern American dish Hoppin John. With a little Sierra Leonean twist of course. 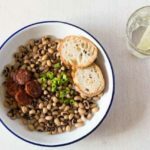 Some just call this dish Hoppin’ John, others may refer to it as Hoppin’ John soup or Hoppin’ John stew. Whatever name you call it, you’ll love its flavour and heartiness. I really like the simplicity of this dish. Essentially, it is a black-eyed bean soup in which the beans are simmered with smoky bacon (or ham), onions, celery and pepper. And in my view this soup gets better the next day and the next day after that. And please do not skip topping this dish with crispy fried bacon and spring onions. They really do elevate it to something special. Yeap, just what you need on New Year’s day or any day of the year. Roughly chop onion, pepper, celery, garlic, chilli and ginger in a food processor. 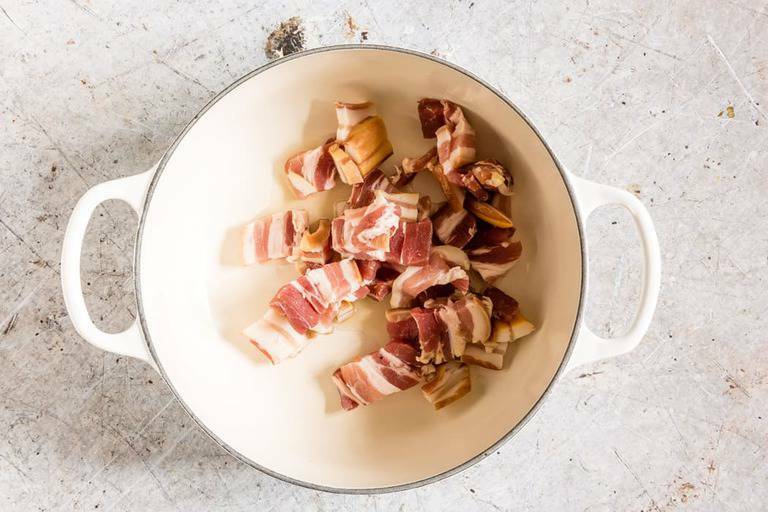 Fry bacon in oil in a pot until the bacon is crispy. Set aside a quarter of the bacon. Add the chopped vegetable mixture to the fried bacon and fry for another 10 minutes. Add the beans, stock, bay leaves and thyme. Mix and bring to a boil. Reduce heat. Cover and simmer for 60 to 90 minutes. Add salt or black pepper to taste. Serve over rice and top with the rest of the bacon and spring onions. 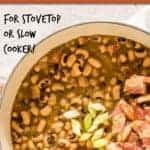 To make slow cooker Hoppin’ John, follow the recipe for the first three steps. When it’s time to cook everything in a large cooking pot, instead place the ingredients in your slow cooker on high. The standard procedure to convert a regular recipe to a slow cooker recipe is to slow cook for four hours on high for every one hour of original cooking time. For this recipe, I recommend that you slow cook on high for 4 to 5 hours. (Or, you can cook on low for 7 to 8 hours.) 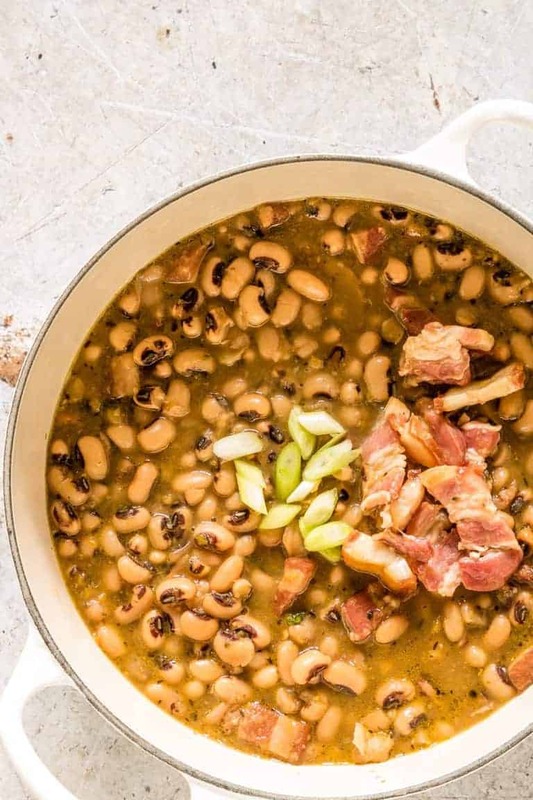 This will give you the perfect slow cooker Hoppin’ John. Yes, you can make this recipe vegetarian too. 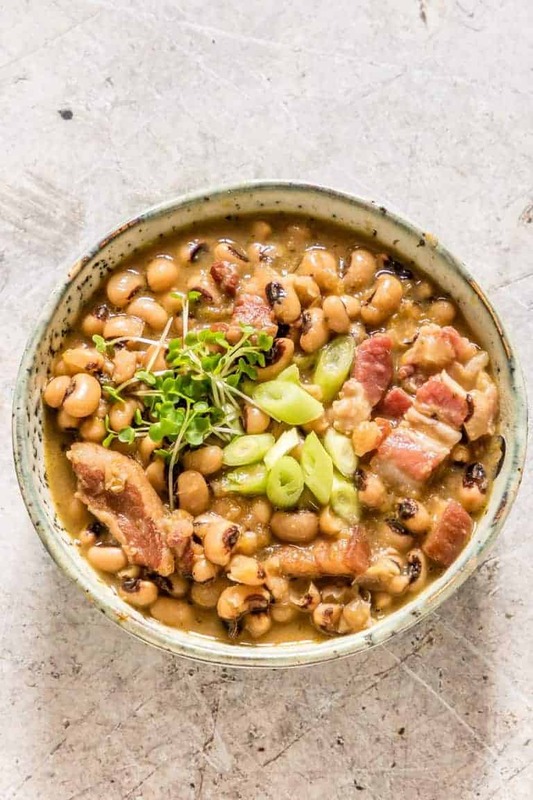 To make vegetarian Hoppin’ John soup, fry the vegetables in olive oil or butter instead of bacon, and substitute vegetable stock for the chicken stock. 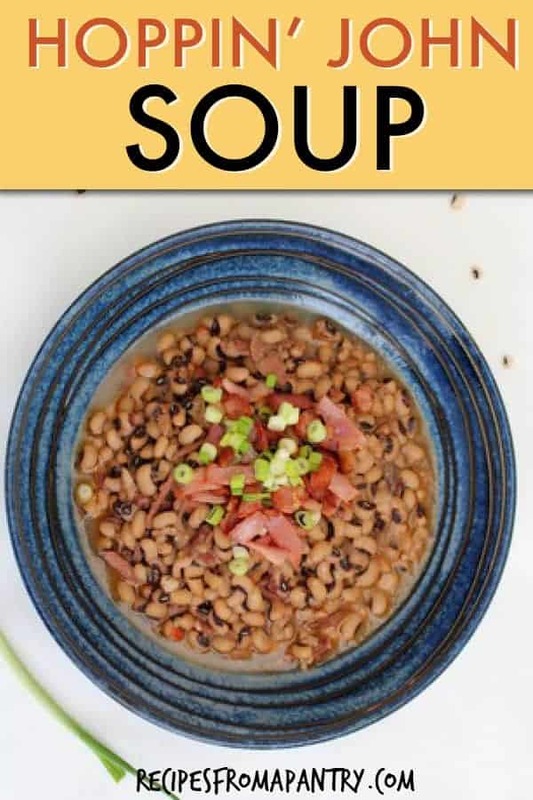 Another option is to make Hoppin’ John soup with canned black-eyed peas (black-eyed beans), although the recipe won’t turn out as well. 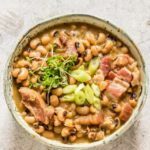 When you simmer your ingredients (or make slow cooker Hoppin’ John), you allow the flavours to mature. If you must use canned beans, simmer your ingredients for at least 10 mins (instead of 60 to 90) to help the flavour develop. 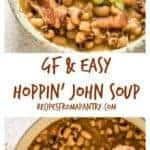 So here is how to make Hoppin John soup. Please do try it and if you do make it, then please do tag #recipesfromapantry on Instagram or twitter so that I can pop over and have a look. It is really, really awesome for me when you make any one of my recipes. You can also share it on my Facebook page. Thank you for reading my Hoppin John Stew recipe post. And please come visit again as I continue dreaming up recipes, traditional African recipes, African fusion recipes, Sierra Leone recipes, travel plans and much more for you. This post has been updated from Dec 2013. The picture below is the original one. 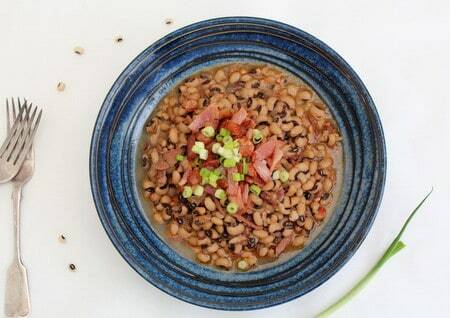 Don't forget to tag #recipesfromapantry on Instagram or Twitter if you try Hoppin' John Soup (Black-eyed Bean Stew)! It is really, really awesome for me when you make one of my recipes and I'd love to see it. You can also share it on my Facebook page. Please pin this recipe to Pinterest too! Thank you for reading Recipes from a Pantry. A lucky New Years black-eyed bean stew with smoked bacon. 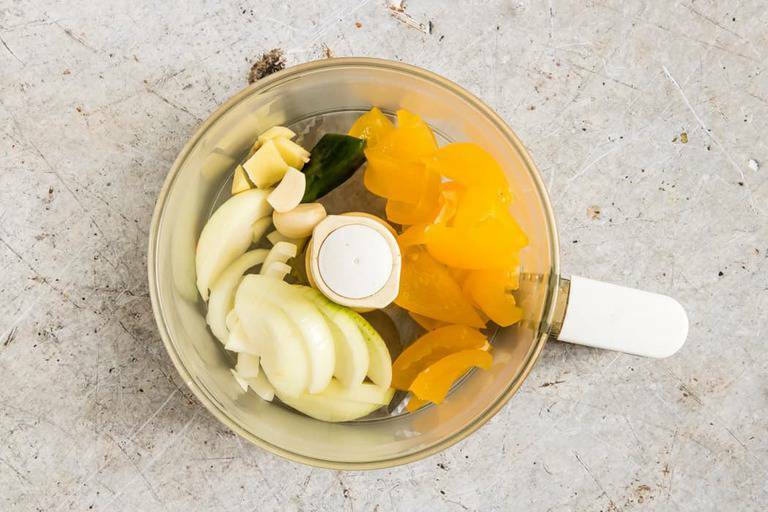 Place onion, pepper, celery, garlic, chilli and ginger into a food processor and chop roughly. Heat oil in a large cooking pot and fry bacon till it is nice and crispy. Remove a quarter of the bacon and set aside for garnish. Add the chopped vegetable mixture to the bacon and fry the mix for about 10 mins, stirring occasionally. Then add in the beans, stock, bay leaves and thyme, mix well, bring to the boil. Then reduce heat and cover and simmer for between 60 -90 mins depending on how soft you want your beans. You may need to add in more stock if it dries out. Add in salt and black pepper to taste. 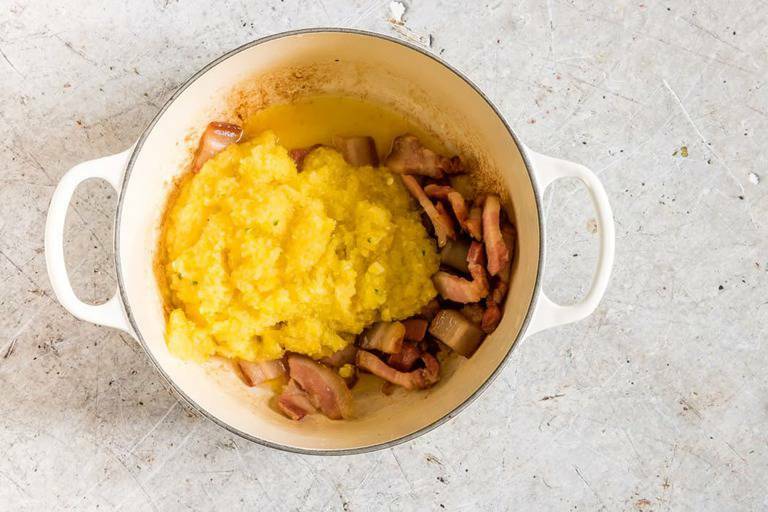 Serve this over rice and top with the rest of the bacon and chopped spring onions. Maggi is a stock cube we use in Sierra Leone. For this particular stock I used 1 Maggi cube for 1 litre of water. I love black-eyed peas! I make them throughout the year. I’m not sure if I’ve ever made them for New Year though. Perhaps, I need to throw some in a pot on tomorrow and bring in the new year with as much luck as possible…. We could use all the luck we can get right? I know what you mean JV. It’s just that I absolutely love black-eyed peas. I cant help trying to eat them no matter what. I will be making some Black-eyed peas later today because the kids love them. 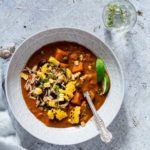 Your Black-eyed Bean and Sweet Potato Stew is definitely calling my name. Best of luck in 2014. I hope you like it Kira. Happy New Year. Hey there girl , black eyed beans are a fav at ours with them topping the most loved beans list! 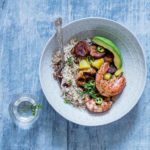 I like the Sierra Leonean twist you have given this dish! 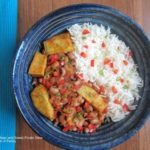 Thanks Manjiri – I would love to check out any black-eyed pea recipes you have. I’ve heard about black eyed peas bringing luck in the new year, but I’ve never had them on new year’s eve before. I need to start that tradition! PS – I voted for you for the award. Good luck! Thanks Tammy. Appreciate your vote. Happy New Year. Wow, this is my kind of recipe. I love rice and I love heat. This looks so hearty and delicious! I love black eyed beans but hadn’t heard about them bringing luck in the new year, I’m going to give it a try! I have never heard of this, but it looks really hearty with all the beans. I would so buy a book of African recipes if you published one. So perfect for the New Year! My mother in law also prepares black eyed peas on New Years for good luck. I love your presentation. 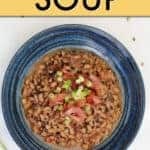 My grandmother used to make this same black eyed peas soup! I shall make this in her remebereence !